I knew we had to make room for him at Jungle Friends -- those eyes! I came across ur website and wanted to find out if you take in monkeys. I witnessed people dump a pet carrier on the side of a highway and decided to make sure nothing was in there, when I approached the cage it was a monkey who was very frightened and bleeding. Everywhere I called would not take him. I decided to try and take him out in a closed area and realized this monkey had no teeth and definitely abused, with a collar wrapped around his neck. I don't want to take him somewhere where they will just put him to sleep. 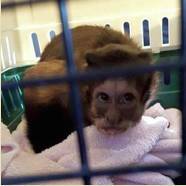 The writer sent this photo (above) of the monkey she found - of course, I couldn't refuse. The day Mongo stepped out of his carrier was the day his life changed forever! Unfortunately, Mongo was quite a distance from Jungle Friends, so I contacted April Truitt at Primate Rescue Center for assistance. 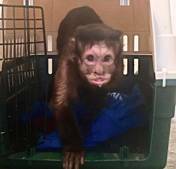 It took some doing, but with the help of so many kind people, this frightened little monkey made it to safety! Mongo was named by one of the compassionate folks who helped get him to Jungle Friends.